Edit. After the launch of the InSight lander was postoponed to 2018, NASA decided to add a second chip reopening the chance to send your name to the page linked above untile November 1, 2017. The InSight (Interior Exploration using Seismic Investigations, Geodesy and Heat Transport) mission is designed to investigate the geology of Mars. 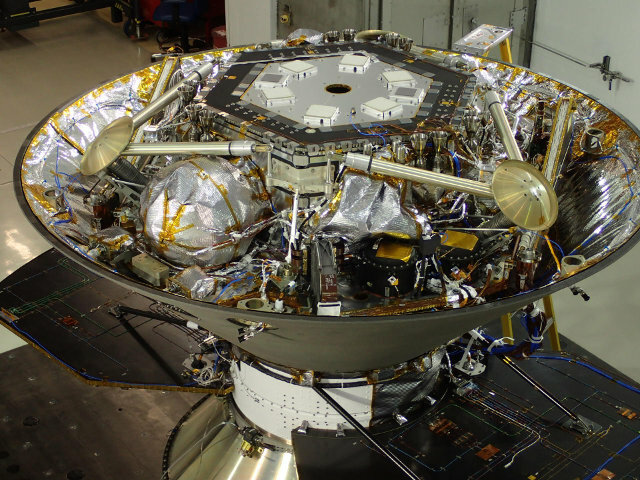 A lander equipped with a seismometer and a thermal sensor will analyze the internal structure of the Red Planet. This will give new information on its formation, contributing to the existing models on the formation of rocky planets such as the Earth. For some time NASA has been trying to get the public involved in its activities with various initiatives. Adding a microchip that records the names of people who joined one of these initiatives is becoming a habit, so much that now NASA has created a standardized system to manage them with even a frequent flyer program. Last year, inthe occasion of the first test flight of the Orion spacecraft, NASA received approximately 1.38 million records of people who participated in the initiative. The microchip will also be transported in the Orion missions to Mars that are in the design stage for the next decade. To record your name in a new microchip that will be transported on the InSight lander you must go to the appropriate page on the NASA website. If last year you were already part of the initiative related to the Orion your data are already registered so you’re a frequent flyer and simply need to enter your last name and the e-mail address used last year to get the new boarding pass. If you’re at your first virtual flight on a NASA spacecraft you need to enter some other data. NASA uses the term boarding pass to make the audience feel involved in these space trips. When it’s created, you can send an email with its link and get the code to include it on an Internet page. There isn’t the symbolism of booking a trip to Mars as in the registration for the Orion flights but it’s still a way to virtually participate in a space mission to another planet. As a science teacher this an outstanding way to get students interested in NASA by having them follow the building, launching, and collecting the data of a mission to Mars.